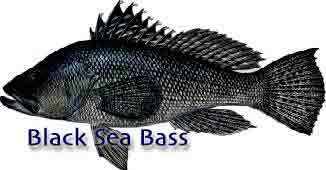 Information on Black Sea Bass Fish Species. Similar Fish: bank sea bass C. ocyurus; other Centropristis. Where found: structure-loving fish, associated with reefs and rubble OFFSHORE; smaller specimens often found INSHORE finger channels. Size: common to 1.5 pounds (13 inches). Are being caught to 5 lbs., 1 oz. Remarks: spawns January through March; protogynous hermaphrodites, older females becoming breeding males; omnivorous bottom feeders, diet including small fish.